Top Notch Material: Win an Assortment of Fertility Aid Products from Fairhaven Health! 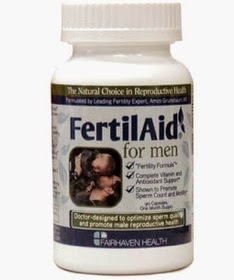 Win an Assortment of Fertility Aid Products from Fairhaven Health! With my boys, I never even had to think about getting pregnant. Seriously, the idea entered my mind, and Bam! I was pregnant. That has not been the case lately. You see, I went three months without getting pregnant, while actively trying- and that is really usual for me, even though I know it is in the "normal range" for many women. So, I contacted Fairhaven Health about possible fertility aids. Let me tell you Sarah has been amazing working with me. She took time to find out about my unique needs and sent me products that she felt really would help me. She decided to send OvaBoost because I am over thirty. She also sent FertilAid Men, even though my husband has no known issues, we thought it would be a good thing for him to take it for good measure. I also received ovulation test and pregnancy tests. I started taking the OvaBoost and hubby the FertilAid Men, and began using the ovulation test....and THAT MONTH I got pregnant! Seriously. That fast! It was pretty amazing. Sadly, at 7 weeks I had a miscarriage, so we will be trying again soon. Actually, after going to the doctor, it is pretty amazing that I got pregnant as fast as I did. It seems somewhere between my last pregnancy (my youngest is not even two) and now, I am missing an Ovary and a Fallopian Tube. I also have some small fibroids and possible ruptured cysts. Wow....seems I have become a virtual fertility train wreck! Even with ALL that going on, I was still able to get pregnant the first month with OvaBoost and FertilAid Men, which is awesome. Now the tricky thing is to get pregnant, and keep the baby. I've been reading that less than 5% of women have consecutive miscarriages though, so I feel hope in that number. While there is no way to increase the number of eggs that a woman has, it is possible to improve the quality of her eggs. Research indicates that egg cells are highly susceptible to harm from free radicals, the unstable oxygen molecules that are produced as the body breaks down toxins. And, to function in a healthy way, egg cells need to produce a tremendous amount of energy. 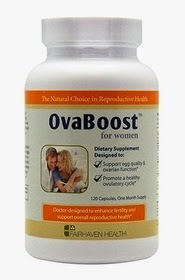 OvaBoost was formulated by a team of medical experts to include key ingredients to protect egg cells from the damaging effects of free radicals and to help egg cells produce the energy they need for successful conception and implantation. The Ovulation Kit obviously worked at let me know when I was ovulating because we got pregnant straight away. The pregnancy tests worked as well, and I took many of them in disbelief that it happened so soon for us! Fairhaven Health really does have products that are amazing! They are a fantastic company that takes the time to listen to their clients, and they CARE! I HIGHLY recommend you checking them out if you are having issues conceiving. Win It: One lucky winner will receive the same pack I did: OvaBoost, FertilAid for Men, Ovulation Tests Strips and Pregnancy Test Strips. i would like all of these things to help with fertility but if i had to choose i think the Fertilaid or the little bundle for her would probably be more for me. I suffered from a miscarriage last July and have been trying and trying and nothing is working.Hope to win this maybe it will do the trick. I would love to try their royal jelly. I have heard great things about it & think it may help us in our TTC journey. I think the Ovacue would help me. I also like their Digital Basal Thermometer. I also entered the Chocolate Bath giveaway. You know your projects stand out of the herd.male fertility There is something special about them. It seems to me all of them are really brilliant!